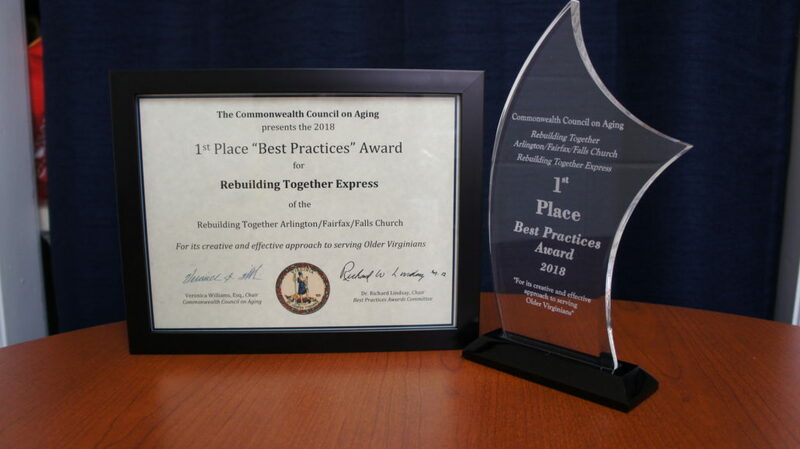 The Commonwealth Council on Aging presented its top Best Practices Award to Rebuilding Together Arlington/Fairfax/Falls Church for demonstrating the effectiveness of surprisingly simple, low-cost repairs to correct health and safety hazards in low-income seniors’ homes. Dr. Richard Lindsay, Chair of the Council on Aging Best Practices Committee, presented this competitive award, which comes with a $5,000 prize funded by Dominion Energy. The award was presented to recognize our new delivery system called Rebuilding Together Express. RT Express focuses on small teams of skilled volunteers making targeted repairs to help seniors age in place. 75 RT Express projects delivered over the past two years by teams of 4-5 skilled volunteers corrected 93% of fall hazards and 90% of all hazards through half-day projects – at a cost of about $500 per home for materials. Christy Zeitz, Executive Director of Fellowship Square Foundation, nominated RT-AFF for the award because she was impressed by the accessibility modifications that RT-AFF volunteers made in 80 apartments for low-income seniors at Fellowship House in Reston last year. 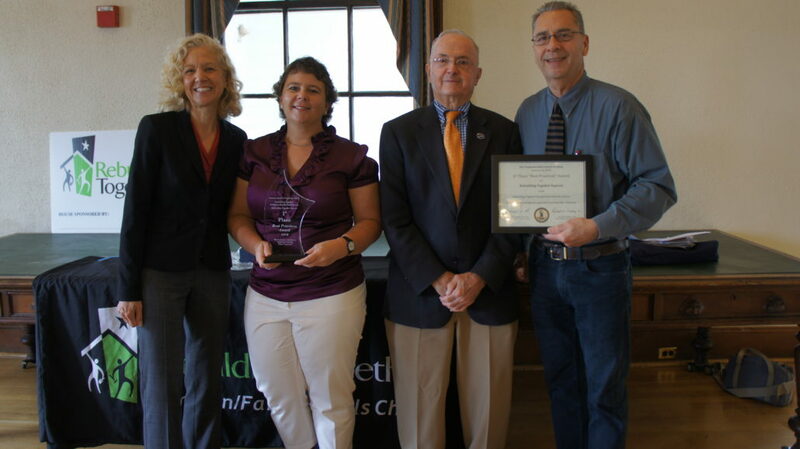 “We are honored to receive this statewide award,” said Patti Klein, Executive Director of Rebuilding Together Arlington/Fairfax/Falls Church, “and we are gratified to see attention directed to the widespread hazards which put low-income seniors at high risk of falls.” “The big news here is that identifying and correcting fall hazards in seniors’ homes is just not that hard,” Klein added. To learn more about fall hazards in the home and how RT-AFF is addressing fall hazards in the homes of low-income seniors read Please Step Inside . Our report summarizes the impact of our first 75 RT Express projects, includes information on the science behind fall prevention, outlines the critical gap in the current continuum of medical care and shows how RT Express contributes to reducing fall hazards.